The Power of Predictive Analytics - E2open | Demand. Supply. Delivered. According to KPMG’s 2016 Global Consumer Executive Top of Mind Survey, the use of predictive analytics will double by 2018. In addition, 46% of companies plan to use advanced analytics to sense and shape demand within the next two years. Gartner made a similar claim in the keynote of its Supply Chain Executive Conference in Phoenix. They cited automation, algorithms and the systematic use real-time data as industry game changers. Why are these such big focus areas? Because they are key to enabling a digital supply chain. In a recent webinar, we took a deeper dive on how predictive analytics such as demand sensing can help control volatility. Two of the discussion topics touched on planning promotions and new product introductions. Both are strategic activities but notoriously hard to forecast with conventional systems. New product introductions: How do you support winners without unproductively tying up capital in items that fall short of expectations? While many companies rely on growth through innovation strategies to drive sales, the sad reality is that innovation is driving complexity instead of sales. Since 2010, there has been a 31% increase in SKUs and only a 6% increase in sales. While everyone likes to think their new product will be a winner, the truth is that only 1% become top sellers; 95% of introductions end up in the tail. (Figures from E2open’s Forecasting Benchmark Study) R&D is a big spend for companies so it is paramount to properly support winners to maximize revenue and achieve return on investment related to innovation. The big question for supply chain leaders is: How do you properly support the winners without being caught with excess inventory for the vast majority of items that fail to meet expectations? A major obstacle is time-series analysis methods used in traditional forecasting. These require a minimum of two years of data – data that new products obviously don’t have. No one can wait two years to forecast an item, especially when one-third of items are turned over each year. As a result, forecast error for new items is notoriously high. It’s typically 50% higher than regular turn business. With safety stock being proportional to error, this means 50% more inventory required to support new items. There has to be a better way. This is where predictive and prescriptive analytics become important. Demand sensing works the way you would expect if planning systems were designed today instead of 30 years ago. Give it all your demand signals and let the engine use algorithms to determine what is predictive for each item-location and automatically publish updated forecasts for execution. Operationalizing real-time data allows companies to understand how new products are actually being received in the marketplace. It also enables companies to properly support new blockbuster products while avoiding unproductive investments in slow and obsolete inventory. Similar to innovation, promotions are important to sales but challenging to predict. The root cause is that traditional forecasting systems rely on seasonal sales this time in prior years. The whole purpose of promotional events is to ensure that history does not repeat itself. For example, a promotion on a popular brand of honey oat cereal at Walmart will boost sales of this item at Walmart compared to prior years. It also cannibalizes sales of similar cereal items, in both Walmart and in other channels. These dynamics drive forecast error for the entire category and increase the cost of the event. While challenging for traditional systems, correlating lift and related cannibalization across all channels is a perfect task for predictive analytics. Imagine sales are short for the quarter; how can you quickly assess the feasibility of a promotional event to make up the shortfall? In the S&OP meeting, planners can run real-time what-if scenarios to evaluate options. For example, what’s the impact of investing $1 million in online spend? As a first step, predictive analytics can quickly crunch the numbers. It can assess that $1 million in online spend is expected to create $3 million in lift but also cannibalize $0.5 million in similar item sales and $0.25 million is other channels. Then, check that there are no supply constraints so you can deliver and commit with confidence. Lastly, once the event is underway, you can monitor promotional executional performance and alert planners to retail compliance issues to maximize the full value. The digital transformation painted by Gartner in their opening keynote presentation and outlined in KPMG’s recent research is spot on. What is most exciting is that this is not an abstract 5-year vision but something taking place right now. Algorithms, automation and real-time data are already driving some of the world’s largest supply chains. It is an exciting time indeed. John heads up Product Marketing, leading a team focused on positioning, messaging and go-to-market strategy for E2open’s next generation supply chain management platform. In this role, he also leads analyst relations. In 2016, John joined E2open through the acquisition of Terra Technology, where he ran marketing, strategy and analyst relations for more than 6 years. 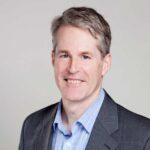 Prior to Terra Technology, John held leadership positions in environmental sustainability, high-tech and data communications industries, with 30 years of experience in marketing, business development, strategy, sales and mergers and acquisitions. John graduated from the University of Toronto with an honors degree in Chemical Engineering.